Welcome to the Peacock Information Center. Serving the peafowl world since 1980. Below, you will learn all about the Peacock Information Center, the history and the services we provide. Be sure to visit our links on the left side of this page. Hope to hear from you soon and visit all of our pages often as new things are posted everyday! In 1980, when Dennis Fett and his wife Debra J. Buck co-founders and co-owners of the Peacock Information Center near Minden, Iowa got married, they never had any idea what kind of journey the next 37 years would take them. When Deb's pet pig, Charly, suddenly died, Dennis asked her what she wanted next and she said peacocks. 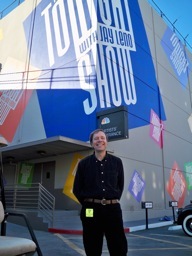 The rest is history with a record two hours and thirty-five minutes of television airtime featuring their life and work with peacocks/peafowl. This amazing record of television air time started with the debut of their first self published peacock book titled, The Wacky World of Peafowl released in 1986. This book is now in its 7th printing and has sold 8,000+ plus copies to date and is still selling well today. This book became an overnight success in 1986 because there was no information on the subject at that time written by actual breeders. This book was self-published long before the Internet was up and running for the general public in 1986 and it sold out in several months. In 1989, Fett woke up in the middle of the night with a musical melody in his head. After transcribing it to music paper he asked his wife, Deb, to write the words to it. Their musical creation, "The Wacky Peacock" gained national attention. They were invited to be a guest on a national talk show making their national television debut on the Lifetime channel show called "Attitudes" starring Linda Dano, in New York City in 1990. Fett had a Bachelor of Music Degree and studied clarinet for six years with Professor Joseph Allard at the Juliard School of Music, New York City. Besides his peafowl endeavors, he is in his eighth year teaching elementary vocal music and elementary band in Northwest Iowa. Soon after their national television debut, the thirst for more information on peacocks/peafowl had the couple self publish a second book in 1990. The Wacky World of Peafowl Volume 2. What made this second book even more of a success is that Fett & Buck had enough prepaid orders to pay the printing bill before going to press. This book is now in its 4th printing and still selling well. In 1991, Fett & Buck started the Peafowl Report, the first and only bimonthly publication featuring everything peacocks/peafowl. In 1996, Buck & Fett created the first and only web site on the Internet featuring peacocks/peafowl information, Their site was given the prestigious USA TODAY HOT Site award in 1997. Today, peafowl.com receives 6,000+ page views each week. Much to the surprise of Fett & Buck, the subject of peacocks/peafowl had garnished lots of attention from the printed media getting the attention of an astounding 29 newspapers and 44 magazines worldwide featuring their work with peafowl/peacocks such as: USA Today, New York Times, Time Magazine, Washington Post, Los Angeles Times, Vogue, Guidepost, Organic Gardening, Animal Fair and many more ! (See resume for full detailed list). The New York Times says "Dennis Fett has an encyclopedic knowledge of peafowl." In addition, Fett and Buck were featured in Writer's Digest Magazine as being one of the three most successful self-published authors in the USA. These credentials will assure that you will be provided with the most comprehensive information anywhere! Not to be outdone, the work of Fett & Buck was also featured on 24 radio shows/stations all over the USA. Even with this record, Fett & Buck have not been sitting back and resting on past works, as they released the Wacky World Of Peafowl music video on DVD in June of 2006. This funny and humorous music video tells how the couple started their life with peacocks/peafowl featuring the song they wrote. In addition, Fett and Buck self produced and released The Wacky World Of Peafowl DVD. The Wacky World Of Peafowl DVD is a companion to their two best selling peafowl books and Peafowl report newsletter. The DVD runs approximately 83 minutes long and gives an instructional and visual view on raising peacocks/peafowl. It was produced, written, directed and filmed by the couple right on their own peacock farm in rural Minden, Iowa. The Wacky World Of Peafowl DVD includes the following: the peahen's egg laying process, the candling of hatching eggs, egg hatching and a fascinating view of a peachick developing in the egg showing the embryo moving inside the egg, the peahen's nesting habits, a cat attacking a peahen and her peachicks, brooder house for peachicks, types of incubators for hatching eggs, species, the fighting peafowl, feather production and molting feathers, watering peafowl in summer and winter, feeding your peafowl and the kind of feed to use, peacock and peahen sounds, peacocks mating peahens, pens and housing size. The DVD concludes showing how peafowl can survive winter in the snow! If we still have your attention, the above information on our work since 1980 will assure you that our 2 peafowl books, The Wacky World of Peafowl, Volume 1 & 2, the Peafowl Report newsletter, and The Wacky World of Peafowl DVD will provide you with the most comprehensive information on the subject of peacocks/peafowl found anywhere! Although Fett does not have a poultry science degree or formal training in poultry, his 42+ years as a music educator, along with his 36 years of first hand experience in raising peafowl, he has educated 1000's each month on peafowl. He did this on his web site, peafowl.com, and with his two books, Wacky World of Peafowl, Volume 1 & 2, The Wacky World of Peafowl DVD and his Peafowl Report newsletter. With all of the above work on peafowl, Fett's research has him holding the record of writing & publishing more on the subject of peacocks/peafowl than anyone in the USA and the world. In addition to peafowl, Fett is a Music Educator and plays clarinet. He is also known as the Clarinet Playing Peacock Farmer. He plays a novelty clarinet act at all his peacock programs. This act has gained Fett national attention. 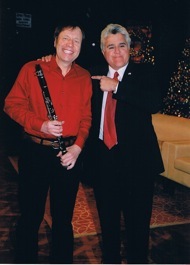 On December 19, 2008, Dennis Fett made an appearance on the Tonight Show starring Jay Leno playing his disappearing clarinet act in the comedy segment called "Does This Impress Ed Asner". This act requires Fett to play his clarinet all together and then gradually disassembles his clarinet taking it apart piece by piece, ending up playing only the mouthpiece. In 2014, Fett & Buck created Mr. Peacock and friends the peacock web TV series all about peacock/peafowl. In 2016, Fett & Buck created Mr. Peacock and friends, hidden treasures. This web TV travel series finds Mr. & Mrs Peacock exploring not well known places around the country side. Today. Dennis Fett (AKA Mr. Peacock) is a paid peacock consultant all over the world helping anyone with peacock/peafowl related issues. We hope to serve you soon with all your peafowl needs and we wish you well as you enter into, The Wacky World Of Peafowl! Click here to download The Wacky World Of Peafowl, Volume 1 & 2, The eBook for your computer or any other eReader that can view a PDF. This e-book is a read only PDF for your eReader or computer, which means you cannot print this book.